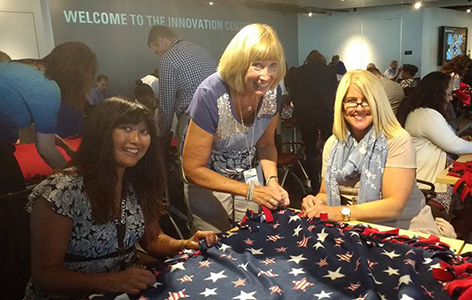 Employees from Motorola had a wonderful time creating patriotic "No Sew" blankets for Soldiers' Angels at a recent event in Chicago. Special thanks to the Motorola Foundation for sponsoring this amazing event! The blankets will be distributed by Soldiers' Angels "Angel" volunteers to veterans at the Jesse Brown VA in Chicago. Click here to see all of the photos from the blanket event.